Time to let the man behind these tools talk! A few weeks back was hosted the ESWC Summer, in Bordeaux, France. There, hundreds of participants and thousands of enthusiasts gathered for 2 days of intense competitive gaming action. For this new edition, the ESWC once more trusted Toornament for its competition management, using the platform from registrations to result reporting on site, and as the main tool at the heart of their production line, with a Live Website and a streamlined video production, for both online and offline assets. Let's see how they used Toornament to create this new live environment! The ESWC Production staff, led by Sylvain Maillard, created a Live Mod on the ESWC Website. There, you can navigate between games, and within each game, between the different official live streams for the competition (most of the competitions were streamed in several languages). In every case, you'd have a panel with all information about the tournament, gathered through the Toornament API (schedule, latest results, participants data, statistics etc.). Here you can see the Live Website, a unique and clear website with all information for spectators: embedded live stream and panel with live results from the competition. Each participant, individual or team, also had his own profile, with its lineup, achievements, latest results and schedule in the competition. 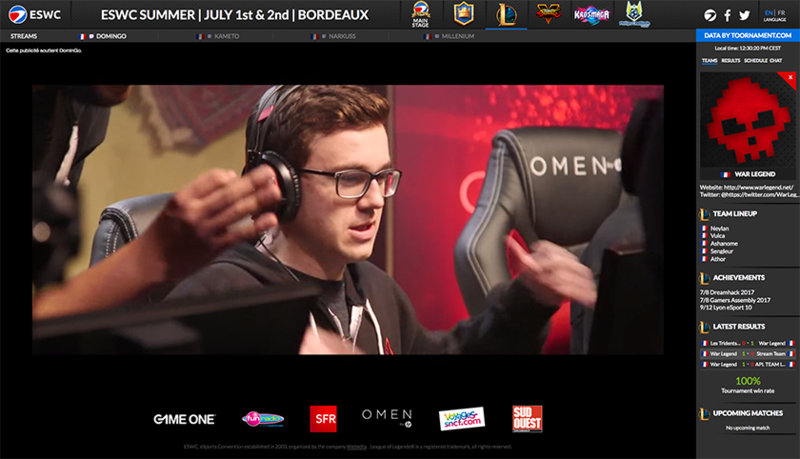 Icing on the cake, the whole thing was fully responsive (so also available on mobile) and automated, so the ESWC Production Team could focus on the event and tournaments once it all started, while the website handled itself communicating with Toornament for its updates. The event featured several tournaments, each with several live streams, and a clear yet complex problematic emerged: how to streamline and centralize the management of overlays to display the tournaments information, with rankings, groups, brackets and sponsors. 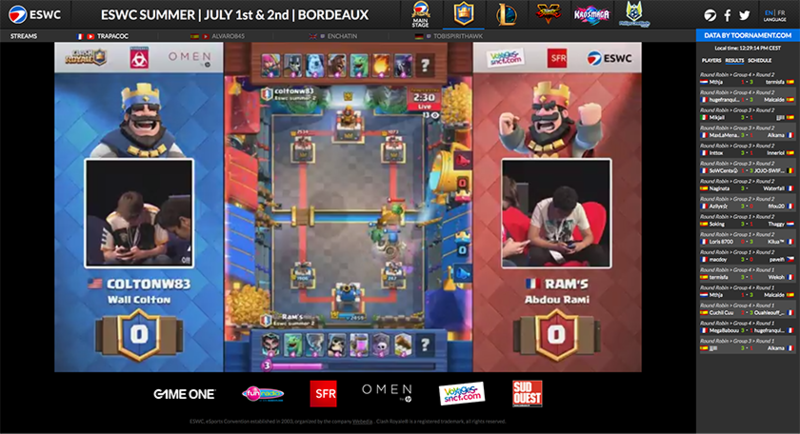 For the Clash Royale tournament for example, there were 4 official streams, in different languages, and matches were played in the Gaming Zone and on stage at the same time. The solution has been the creation of several overlays, covering tournaments, with all stages and matches available to be quickly used in the different productions. A group, a bracket, and a single match page in the ESWC Overlay, with up-to-date information gathered from Toornament. Hello Toornament.com! I am Sylvain Maillard, and I work with the ESWC staff since 2006, first as tournament manager and for a short while as content manager. Created in 2003, the ESWC is one of the oldest esports competitions. Today a convention-type event, the ESWC consists of several events a year, where we manage or host video games competitions, notably for publishers. Come and read the complete interview in the detailed UseCase about the ESWC Summer! With our open API, you too can optimize your production process for all your tournaments and events, so if you are an organizer with a project, don't hesitate contacting us to see how we can help you!